The 1886 Hurricane at Sabine Pass, Texas. In October 1886, Sabine Pass was the second largest town in Jefferson County, boasting a new rail line and an optimistic outlook on continued growth as a major coastal port. On the afternoon of October 12, just two months after a hurricane had destroyed the Texas port of Indianola (200 mi. SW), a fierce storm ravaged the town of Sabine Pass. The hurricane's strength lay in its 100 mile-per-hour winds and the swiftly rising water that swept homes off their foundations and carried people and animals as far as 25 miles away. Eighty-six people, including entire families, were killed, and only two of 77 houses remained intact after the waters subsided. Stories of survival are documented as well, signifying the determination of residents to endure the storm. Rescue and cleanup efforts began promptly, with the citizens of Beaumont, Orange, Galveston and Houston providing boats, rescue teams and financial assistance. Special legislative action provided tax relief for the storm-ravaged area, exempting citizens from payment of state and county taxes in 1886. 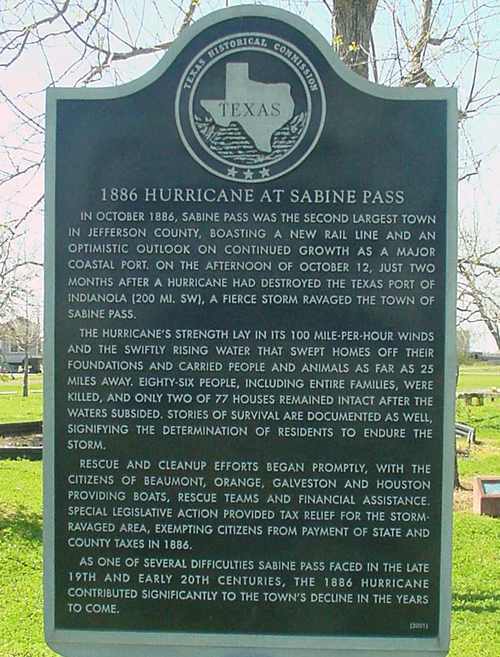 As one of several difficulties Sabine Pass faced in the late 19th and early 20th centuries, the 1886 hurricane contributed significantly to the town's decline in the years to come.